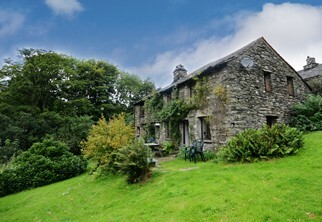 ﻿ High Beckside Holiday Cottage for 7 in the Lake District. Pets Welcome. 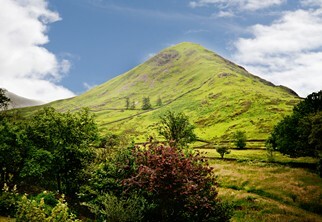 Welcome to High Beckside, our holiday cottage in Hartsop in the Lake District National Park. This 17th century farmhouse has been in our family for generations and offers self catering accommodation for 2 to 7 people looking to enjoy rural tranquility in the magnificent Lake District. So whether you’re a couple, looking for a family holiday cottage, or looking to escape to the Lake District with friends, High Beckside provides the perfect destination. High Beckside cottage is a very traditional, cosy and comfortable farmhouse, decorated with touches reflecting the local landscape and our life on nearby Crookabeck Farm, including Herdwick wool carpets and throws. There is ample space to relax and enjoy your holiday, with 3 bedrooms in the main house as well as an additional wool loft (accessed from an external staircase outside the front door) which is a spacious ensuite twin bedroom with great views of the fells. There is also a family bathroom upstairs with a separate w/c. Downstairs there is a cosy living/dining area with many original features, including oak beams and a spice cupboard dated 1707 next to the fireplace. There is a well equipped open plan kitchen with Lakeland stone worktops. The original oak panelled entrance hall also leads to a drying room, laundry room, and downstairs w/c. Free Wi-Fi is available in the main house. Outside the wonderful garden surrounds the farmhouse and offers a tranquil mix of wild and grass areas ideal for barbeques and picnics. There is also a stream at the bottom of the garden (well fenced for safety). The garden is a magnet for the local wildlife and birds, with badgers being regular visitors. There is also ample parking for 2 to 3 cars. 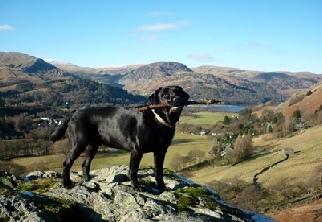 We welcome 2 well behaved dogs at our cottage aty £15 per dog per week. The local area has some fantastic walks straight from the door. Most of the local pubs are dog friendly, and you can be sure that both you and your dogs will find High Beckside the perfect holiday home. High Beckside holiday cottage is located in the peaceful conservation village of Hartsop. It is close to Brotherswater, Ullswater and Helvellyn in the Lake District. The area offers a huge range of activities to suit all tastes, including fell walking, sailing, mountain biking and much more. We are within 40 minutes drive of many of the Lake District’s main attractions, including Windermere, Grasmere, Ambleside and Keswick. Please contact us to check availability or for more details. Alternatively click here to check tariff & dates. Please contact us to enquire about Low Season short breaks from £345. We look forward to welcoming you to High Beckside soon.